The first time I ever tasted Nutella, I was on a three month-long bike trip in France. It sounds romantic, doesn’t it? Rather than spending spring trimester of junior year in a classroom, I spent it on a bike riding through five different regions of France. Even as I type that I think,”Man, that sounds amazing”. Parts of it were amazing. But not seeing the sun for 14 days straight and camping in soaking wet tents along the side of the road was not. I was 16, cold, wet, hungry, and homesick. Food was more important to me than it ever had been in my life up until that point. Meals, homestays, and mail were the things that kept me going through what proved to be a difficult trip. All of us carried food with us either in our paniers or, as in the case of baguettes, strapped to the back of our bikes. There were certain things that some people were never without. For me it was a large bar of chocolate. Others were intensely loyal to Nutella. I thought the idea of spreading a chocolate/hazelnut mixture on bread sounded like a strange and not-all-that-appetizing practice. The color and consistency of Nutella turned me off so I didn’t eat it. Then one day, when I had run out of jam, I accepted a smear from a friend and then – oh yes – I understood. What does this have to do with ice cream? Friends, this is Gianduja Gelato. In other words, Nutella ice cream. Oh, and with a ribbon of dark chocolate running through it. 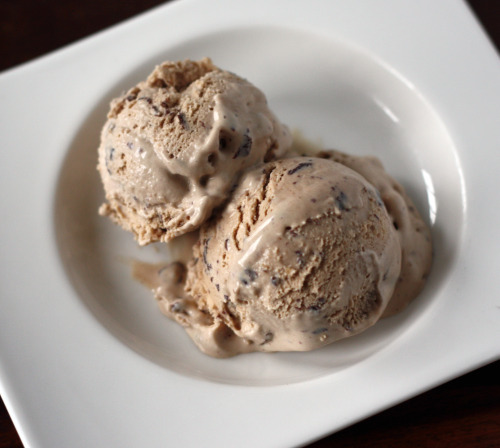 Homemade ice cream will impress just about any dinner guest (“You made the ice cream? ?”), but just to totally blow peoples’ minds, try serving this with Nutella Pound Cake. Prepare yourself for praise. Put the milk chocolate pieces in a large bowl. Heat the remaining 1 cup cream in a medium saucepan until it just begins to boil. Pour it over the milk chocolate pieces and stir until the chocolate is completely melted and smooth. Set a mesh strainer over the top. Pour the hazelnut-infused mixture through a strainer into a medium saucepan, squeese the nuts firmly with your hands to extract as much of the flavorful liquid as possible. Discard the hazelnuts. Stir the mixture constantly over medium heat with a heatproof spatula, scraping the bottom as you stir, until the mixture thickens and coats the back of the spatula. Pour the custard through the strainer and stir it into the milk chocolate mixture. Add the vanilla and stir until cool over an ice bath. In a clean, absolutely dry bowl set over a saucepan of simmering water, melt the chocolate stirring it until it is absolutely smooth. Mixing it in: Drizzle a thin stream of the warm chocolate into the ice cream during the last possible minute of churning. 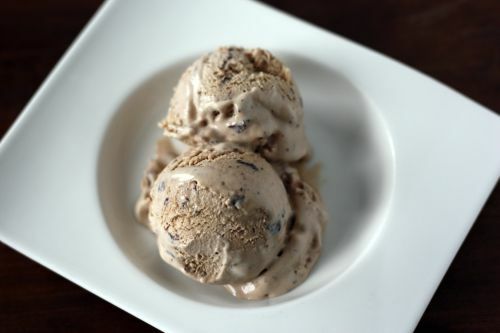 If the chocolate clings too much to the dasher, remove the ice cream from the machine and drizzle the chocolate into the frozen ice cream by hand while you layer it into the storage container, breaking up any chunks as you stir. Oooh, this sounds so perfect! I’m just waiting for the nice hot weather to finally arrive before I pull out my ice cream maker! Oh, this is right up my alley! I adore Nutella, or anything with chocolate and hazelnut. I look forward to an excuse to make this! Oh dear me…this is not what I needed to see tonight – I’ve been craving both chocolate and Nutella all week for some reason. I can just imagine how good this would be on that pound cake. Delightful…Nutella is my best friend! I fell in love with Nutella during my sophomore year of college. We’d always had it at home but I discovered how delicious it was when paired with freshly picked apple slices. Amazing! But not as amazing as this gelato. Because even though Nutella is delicious. I’m sure it’s even more delicious in ice cream form. YES! So this is timely for me. My little sister is graduating from college in a few weeks and I’m flying out to see it, obviously. But I wanted to bake something for her and write her a little tribute on my blog–not necessarily for her to eat since she lives across the country, but just kind of a token of celebrating her in my little SF apartment. I was thinking last night what it should be : cake, cupcakes…then I came to the conclusion that since her favorite food (can we call it that?) is Nutella, it’d be something with Nutella. I was thinking a free-form galette, but I’ve just broken out my ice cream maker and this looks incredible. Thanks so, so much for the inspiration! I spent some time in Italy a few years ago, and Hugh visited me for a month of that time. He always kept a big jar of nutella, and I swore to him I didn’t like it and I “wouldn’t eat all that fake stuff”. I broke down, I got desperate, and he would find my finger treads through the sides of the jar. I tried to hide it, but when you use your finger as a spoon, there is only so much disguising you can do :) Looks amazing, Dana. No one can resist chocolate and hazelnut, I repeat, NO ONE. ooh, i am quite sure this will bring me right back to italy. a scoop of gianduja and a scoop of pistachio. perfection! This sounds amazing beyond words! I must go to the store asap and get my hands on a jar of nutella! my my, im so gonna bookmark this. have you tried nutella crepes? they taste AWESOME. Oh my goodness! I’m just starting my day here and this will send me on a Nutella binge for certain. I have made your Nutella poundcake and love, love, loved it. This gelato is something I will most definitely have to try my hand at, preferably with my daughter who first introduced me to this hazelnut delight! However will I be able to get on with my day just thinking about this? Woe is me! Maybe if I just spread a little on a slice of toast . . . This is my favorite gelato, hands down. I can’t wait to make it all summer long. Are you kidding me?!!! That looks so amazing. I’m dying right now. I’m a late comer to the Nutella party as well. But I am now a convert. You did a great job on that ice cream it looks fantastic and I bet it taste wonderful too! Everytime I learn something new about you (like that you spent time in France at 16, which I did, too), I realize that at some point, you and I are going to realize our paths crossed earlier in life. I don’t mean to be all cosmically weird on you, and I know we did meet f2f last November, but the commonalities are starting to flip me out a little. I keep reading about The Perfect Scoop, and now that the weather is warming I really do wonder why I’m the only person on the face of this planet who doesn’t yet own this book. 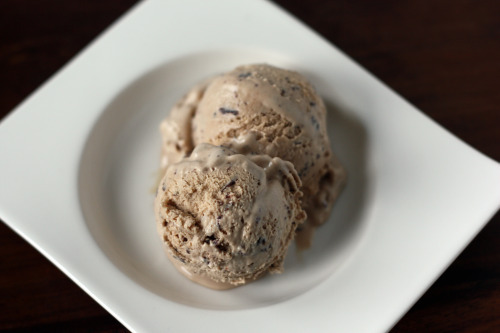 My kids would flip for this gelato recipe. p.s. Hopping over now to read the Amazon fresh post. So excited! I lust after Nutella. And gelato. Which means I should probably make this. I seem to be the only person wondering what to do with those hazelnuts?! I don’t like food going to waste. I might add some to the mix when the ice cream is churning. But it is a lovely recipe! Thank you for sharing!